3.7 out of 5 based on 19 bloggers and 8 commenters. 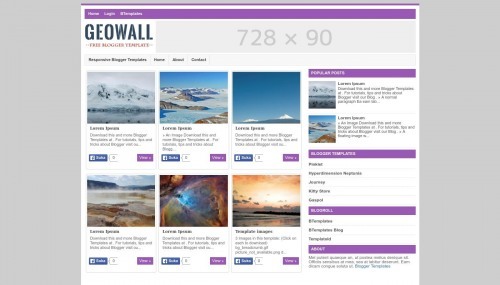 GeoWall is a free blogger template with 2 columns, responsive design, right sidebar, gallery-styled, an exclusive design for Blogger, ads ready, posts thumbnails, breadcrumbs, related posts support and neutral colors. Excellent template for blogs about news, photography, a personal portfolio site or travel. why cant upload to my blog ? I like this template, may i ask you ?